Harvard Pilgrim agreed to cover Amgen’s cholesterol drug, Repatha. Harvard Pilgrim Health Care has agreed to cover Amgen Inc.’s pricey new cholesterol drug in exchange for a discount, along with potential rebates if the treatment fails to meet performance targets. The companies said the deal was the first pay-for-performance contract for the cholesterol drug, called Repatha, though Amgen is negotiating similar pacts with other insurers. Executives at Harvard Pilgrim, the Wellesley-based plan that insures about 1.2 million members in Massachusetts, New Hampshire, Maine, and Connecticut, are hoping the contract can help establish a new model for reimbursing makers of high-priced specialty medicines at a time of mounting concern over spending. Unlike most contracts in which companies are paid set amounts regardless of how well their medicines work, pay-for-performance deals seek to tie payments to how effective drugs are. 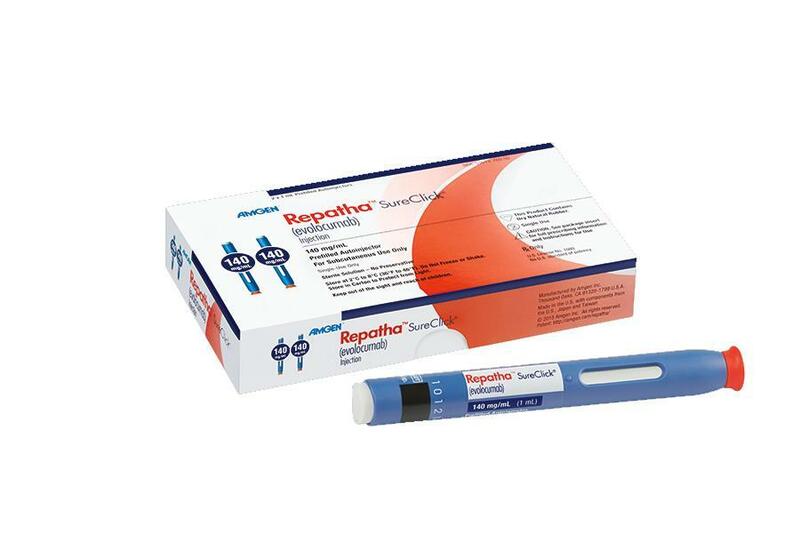 Repatha is one of two drugs in a new class of what’s known as PCSK9 inhibitors recently approved by US regulators. They are geared not to the majority of Americans with high cholesterol but to a subset of about 10 million people. Those include people at high risk of heart attacks or strokes, people who can’t tolerate traditional cholesterol medicines called statins, and people with a disorder called familial hypercholesterolemia that causes high levels of LDL cholesterol. Both drugs dramatically reduced cholesterol in clinical trials, but both are expensive. Amgen has a list price of $14,100 for a year’s supply of Repatha, while a competing drug, Praluent, marketed by Sanofi SA and Regeneron Inc., costs $14,600 a year. A report from a nonprofit watchdog group, the Boston-based Institute for Clinical and Economic Review, suggested the medicines should cost 85 percent less to represent reasonable value. Harvard Pilgrim agreed to include Repatha as the only PCSK9 drug in its formulary, the list of medicines for which it reimburses health care providers who prescribe them. Amgen, meanwhile, agreed to a discounted price and to additional rebates if the drug doesn’t reduce cholesterol to specified target levels for different patient groups and if the total dollars it pays out exceeds another target. The parties wouldn’t disclose any of the financial details. Michael Sherman, chief medical officer of Harvard Pilgrim, estimated that slightly less than 1 percent of the insurer’s members would be eligible to take Repatha. But he said the number of patients actually taking it would be lower because the drug is an injectable — unlike statins, which are taken orally — and some people don’t like to inject themselves with needles. “This drug is highly effective,” Sherman said, “but by any rational benchmark it’s overpriced” at its listed annual wholesale price. Other insurers and pharmacy benefits managers, which negotiate with drug makers on behalf of health plans and employers, have also been trying to design pay-for-performance contracts, though the movement is still in its infancy. Harvard Pilgrim in January became the first regional health insurer to negotiate a discount on a costly new hepatitis C drug regimen that cures more than 90 percent of people with the virus, signing a one-year contract with Gilead Sciences Inc., maker of the two-drug Harvoni treatment for the liver-ravaging disease. That category of drugs, like the PCSK9 inhibitors, had two competing products, giving the insurer more leverage in its bargaining. Executives at Amgen, based in Thousand Oaks, Calif., have defended their price for Repatha and taken issue with critics who say they are overcharging. But they also said they support the move to what they call “value-based” pricing in which drug makers and insurers agree to certain measures of a drug’s effectiveness. ■ Patients with familial hypercholesterolemia, an inherited disorder resulting in high levels of LDL cholesterol. ■ Patients who can’t tolerate statins because of side effects such as muscle aches. ■ Patients who are at high risk of atherosclerotic cardiovascular disease conditions, such as heart attack or stroke, who have been resistant to treatment. Source: Harvard Pilgrim Health Care.